On 16/02/2019 in Wellingborough wilfully obstructed PC King in the execution of his duty. Plea: Guilty. Fined £80, surcharge to fund victim services of £30, costs of £85. On 17/02/2019 drove a green VW Polo in Horsemarket, Northampton, after consuming so much alcohol that the proportion of it in your breath, namely 75mcg of alcohol in 100ml of breath, exceeded the prescribed limit. Plea: Guilty. Fined £120, surcharge to fund victim services of £30, costs of £85, banned from driving for 36 months. 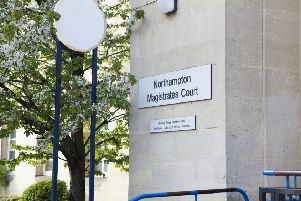 On 16/02/2019 in Northampton failed to provide a specimen of breath for analysis in the course of an investigation into whether you had committed an offence when suspected of having been in charge of a vehicle; in Wellingborough resisted PC King in the execution of his duty. Plea: Guilty. Fined £575, compensation of £100, surcharge to fund victim services of £34, costs of £85, driving licence endorsed with 10 points. On 09/02/2019 in Irthlingborough, assaulted a female by beating her. Plea: Guilty. To participate Building Better Relationships programme for 60 days, pay a surcharge to fund victim services of £85, costs of £85. Between 25/01/2019 and 14/02/2019 in Kettering pursued a course of conduct which amounted to the harassment of a female and which you knew or ought to have known amounted to the harassment of her in that you continually called, messaged and pestered her, causing her to feel harrassed. Plea: Guilty. To participate in Building Better Relationships programme for 60 days, restraining order prohibits defendant from 1) contacting victim directly or indirectly 2) going to a named street in Kettering 3) going to a named school in Kettering. This order lasts until 05/03/2021. To pay a surcharge to fund victim services of £85, costs of £85. On 07/01/2019 in Kettering assaulted a female by beating her. On 11/02/2019, 31/12/2018 and 04/02/2019 in Corby assaulted a female by beating her; on 11/02/2019 in Corby assaulted another female by beating her; on 14/02/2019 in Corby resisted PC Katie Hibbert in the execution of her duty. Plea: Guilty. Jailed for 17 weeks suspended for 24 months, to have treatment for drug dependency as a non-resident for four months, to participate in Building Better Relationships programme for 60 days, to pay compensation of £150, surcharge to fund victim services of £115, costs of £85, restraining order prohibits defendant from 1) contacting first victim directly or indirectly 2) going to a named street in Corby. This order lasts until 05/03/2021. On 02/05/2018 and 05/05/2018 stole five face creams, of a value unknown, from Boots, Rushden Lakes. Plea: Guilty. Fined £80, compensation of £79, surcharge to fund victim services of £30, costs of £85. Between 29/12/2018 and 12/01/2019 in Kettering pursued a course of conduct which amounted to the harassment of a female and which you knew or ought to have known amounted to the harassment of her in that you sent unwanted WhatsApp messages, emails and text messages, and made unwanted contact by phone on numerous occassions. Plea: Guilty. To participate in Building Better Relationship programme for 50 days, restraining order prohibits defendant from 1) contacting victim directly or indirectly 2) going to a named street in Kettering. This order lasts until 05/03/2022. To pay a surcharge to fund victim services of £85, costs of £250. On 05/05/2018 stole electrical items, of a value £778, from Boots, Rushden Lakes. Plea: Guilty. To carry out unpaid work for 40 hours, pay a surcharge to fund victim services of £85, costs of £85. On 02/02/2019 drove a Renault Clio in Oakley Road, Rushton, after consuming so much alcohol that the proportion of it in your breath, namely 93mcg of alcohol in 100ml of breath, exceeded the prescribed limit. Plea: Guilty. To carry out unpaid work for 100 hours, pay a surcharge to fund victim services of £85, costs of £85, banned from driving for 23 months.